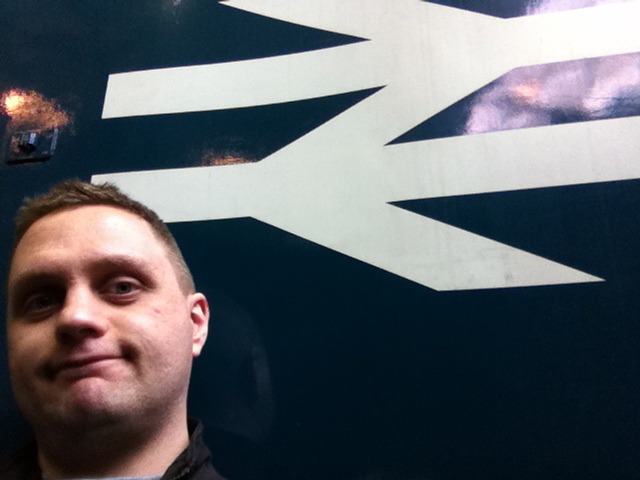 Ho hum: British Rail. Yes, I know it was never actually as good as it seems now, and it was an organisation that mostly functioned better as an idea, or an advertising concept, rather than in practice. But seeing it printed there on that piece of card evokes more than a tinge of sadness in me for something that, like Radio 1 on the Medium Wave and crossed lines during telephone conversations, was loved in spite of rather than because of its existence. 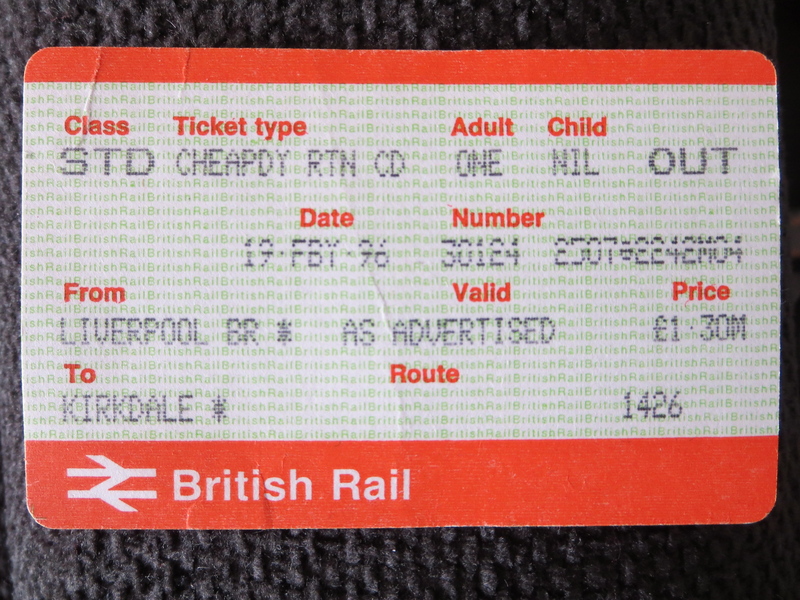 The ticket is for a journey I made by way of a return favour. I’d struck a deal with my next-door neighbour in my hall of residence at Liverpool University. If he came with me to a Smiths night at Hardy’s in Hardman Street (a desperately shabby nightclub of a mostly indie persuasion, now long gone), I would go with him to see Cardiff City, his team, the next time they had an away match nearby. This day arrived on Saturday 18 March 1995, when Cardiff were away to Wrexham. It was, I’m not ashamed to admit, the first time I’d been to a football match. And it remains, to date, the first of only two football matches I have seen in my entire life. The second one was also a Cardiff game, this time at Chester’s pompously-titled nation-straddling Deva stadium. The game at Wrexham was in much more lowly surroundings: Wrexham Racecourse. I could see it as our train arrived into the town. It looked tired and unhappy. It smelt like a black-and-white film. Yet I was determined to keep an open mind and treat the whole thing as a bit of an adventure, which, for a fiercely ill-educated non-football fan such as myself, was really the only strategy I could adopt. 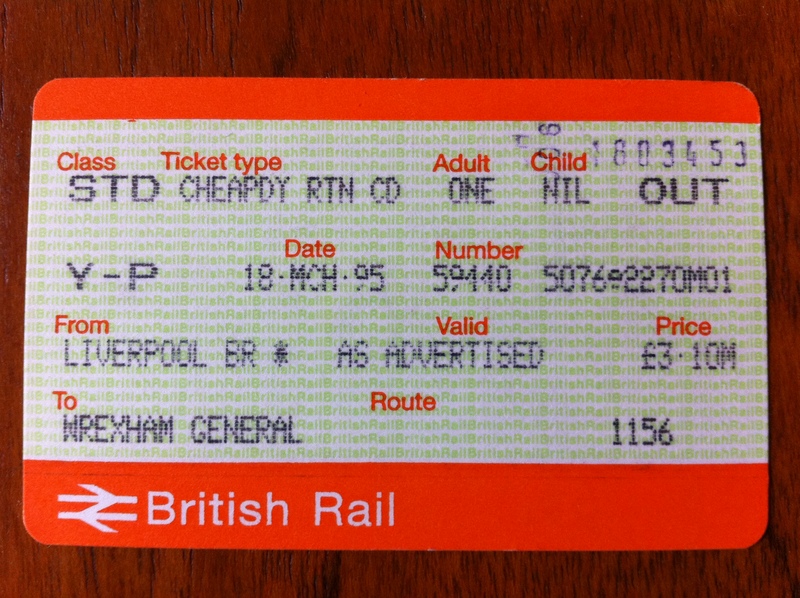 I don’t remember much about the journey, nor why I decided to keep my train ticket (establishing a precedent that has continued, more or less, to this day). The fact that Cardiff won 3-0 undoubtedly made it more of an enjoyable occasion than would otherwise have been the case. The fact they won by, as far as I could see, booting the ball as far as they could up the other side’s end, then racing after it to try and score, didn’t bother my friend or any of the 200-odd supporters who made up the sparse crowd at the away end. I learned that Cardiff fans hated Wrexham fans, who they mocked by shouting “Wrexham! Wrexham!” in a high-pitched voice, as if to cast doubt on their masculinity. I also learned that some of Cardiff’s youngest fans knew some of the choicest profanities on the planet. It cost me £8.50 to get into the ground, a sum that I described in my diary entry for the day as depressing, given “I’ve a week ahead where I can’t spend much money”. I also mentioned being struck at the “real community feeling” amongst the Cardiff fans, “a sort of extended-family warmth”. This sounds a bit over-the-top, but it was true at the time and for a football novice was very reassuring, even comforting. I didn’t see much more of Wrexham during the trip, apart from a bakery in which me and my friend bought food before – but not after – the game. It was a bitingly cold day and by the time we were back in Liverpool it was pouring with rain. Right outside our hall of residence I was splashed by a car racing through a giant puddle. However this did not, to use a painful cliche, “dampen my spirits”, as by that point I was basking in that sense of achievement that comes from trying something new – albeit fairly trivial – and surviving. The following day, a Sunday, Liverpool beat Manchester United 2-0. I can’t say my interest in football persisted beyond the weekend, but I see from my diary that I took care to note that the name of our team in that evening’s quiz in the student common room was: Man Utd Are Fucked Now, Aren’t They?